University of Maine's Andrew Fleming tries to drive to the basket past Central Connecticut State University in a November 2016 file photo. ORONO, Maine — After a 2016-2017 campaign that began with myriad injuries and included a well-publicized altercation, the University of Maine men’s basketball team is seeking a new beginning this winter. Eight of the 17 players on the roster are first-time Black Bears, a ninth will be seeing his first UMaine action after sitting out last year as a transfer and two others are back after suffering season-ending injuries last winter. Several others have transferred out of the program, including last year’s leading scorer, guard Wes Myers, whose season ended prematurely after a Valentine’s Day locker room incident in which he broke a teammate’s jaw with a punch. Myers is playing as a graduate transfer at South Carolina, a Final Four team last April. “In a lot of ways because of what we’ve gone through with the personnel issues and the transfers, this feels like a first year with a lot of new guys,” said fourth-year UMaine coach Bob Walsh, who admits he must have patience. 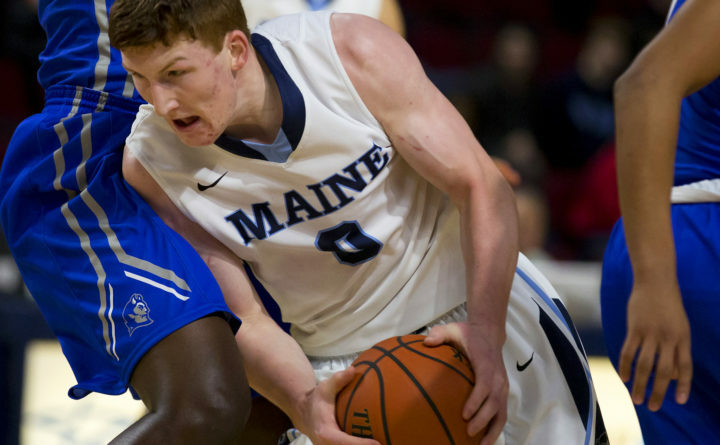 UMaine (7-25 overall, 3-13 in America East last winter) is led by 6-foot-7 sophomore forward Andrew Fleming of South Paris, an AE All-Rookie Team choice after averaging 10.7 points and 6.5 rebounds per game. Other prime returners include fourth-year point guard Aaron Calixte, limited to five games last winter by a foot injury; 6-5 swingman Ilker Er, a 41-percent 3-point shooter last season before being sidelined after 11 games by a knee injury; 6-7 forward Ilija Stojiljkovic, 6-1 guard Garvey Melmed of Greenbush, and Danny Evans, a 6-5 sophomore who played on Great Britain’s U-20 national team last summer. They are joined by 6-5 Dusan Majstorovic, a transfer from LaSalle; Miks Antoms, a 6-8 forward from Latvia via Lee Academy; and several promising junior college transfers in 6-1 guard Trae Bryant, 6-5 wing Isaiah White, 6-6 forward Duncan Douglas; 6-5 guard Vernon Lowndes Jr. and 5-10 guard Celio Araujo. While the roster boasts depth, it is also undersized up front — particularly with 6-8 sophomore center Vincent Eze sidelined for the year after undergoing offseason hip surgery and Douglas nursing a stress fracture in his foot — and faces a major challenge on the backboards and defensively against taller front lines. UMaine’s ability to avoid the America East cellar by March will depend in part on how the team melds during a non-conference schedule that is part preparatory, part fundraiser. Beginning with Friday night’s opener at Boston College, part of the 2017 Hall of Fame Tipoff Tournament, the Black Bears face six “guarantee games” that will generate approximately $450,000 for the university’s athletic department. Other guarantee-game opponents on the road before the New Year are Texas Tech, Georgetown, Fordham, Saint Joseph’s (Pennsylvania), and Massachusetts. Defending champion Vermont is favored to earn America East’s automatic bid to the NCAA tournament, while Albany, Maryland Baltimore County and Stony Brook among other top contenders. UMaine was picked last in the AE preseason coaches’ poll. How UMaine fares likely will determine Walsh’s future with the program. He’s in the final year of his initial UMaine contract and athletic director Karlton Creech said in March that he would wait until after this season to decide on whether not to extend Walsh’s stay on the Orono campus. Walsh says he’s focused on trying to get the most out of his roster. “I’m pretty sure we’re all day to day when you think about it,” he said. “I love it here. I love the opportunity. I love the culture of the school, the people. The kids we’ve got in this program that really want to be here are a ton of fun to coach every day, and it’s pretty easy just to invest in their success and work to make them better.